A solid foundation for winter comfort! Start your day in the field right with these cozy Czech classics. Insulated cotton knit helps control body heat for optimal warmth, from stationary in your deer stand to high speed while you cross off your daily chore list. Our smart surplus buy keeps your budget happy! 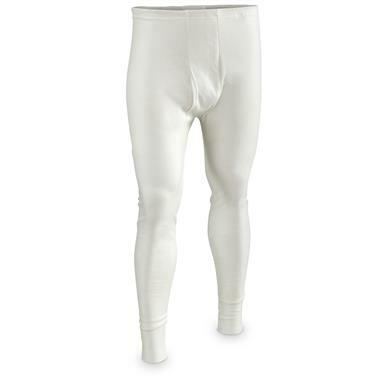 6 pairs of military-grade Long Johns, here for LESS! Condition: New, never issued. Will show signs of fading or slight discoloration due to long-term storage. Czech Military Surplus Cotton Long Johns, Bottoms, 6 Pack, New is rated 5.0 out of 5 by 2. Rated 5 out of 5 by Serape from Thin but useful Really thin with weak elastic. But great for a thin underlayment or for pajamas. Great price.